The banking and financial landscape in the past 5 years have been inundated with ‘techs’. FinTech, InsurTech and RegTech are just some of the new buzzwords each time innovation and disruption are being mentioned. 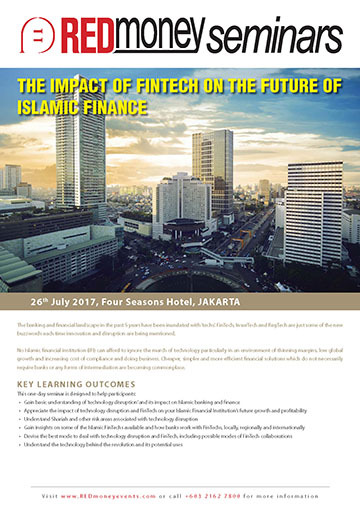 No Islamic financial institution (IFI) can afford to ignore the march of technology particularly in an environment of thinning margins, low global growth and increasing cost of compliance and doing business. Cheaper, simpler and more efficient financial solutions which do not necessarily require banks or any forms of intermediation are becoming commonplace. As a participant in the CFA Institute Approved-Provider Program, SHAPE Knowledge Services has determined that this program qualifies for 6 credit hours, including 0.5 hour in the content areas of Standards, Ethics, and Regulations (SER). If you are a CFA Institute member, credit for your participation in this program will be automatically recorded in your CE tracking tool. Are these just tech hype? No government, no regulator, no go?